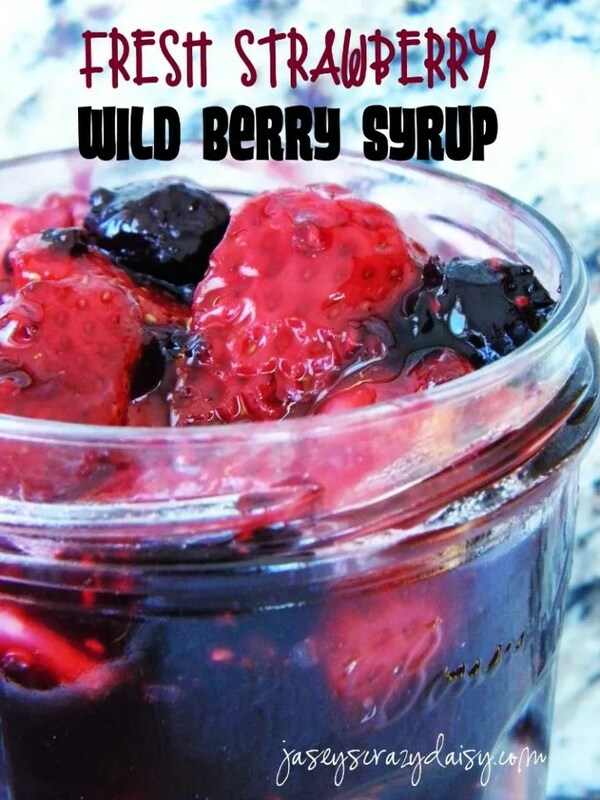 This Wild Berry Syrup with Fresh Strawberries is soooo good! I have an issue with squishy berries. I just can’t stand what happens to frozen strawberries once they have thawed. I can’t take the texture of large chunks of strawberries in baked goods or yogurt either. I find it totally gagariffic! I remember my first encounter with mushy berries. I was at a barbecue when I was a little girl and was served a slice of angel food cake with whipped cream, and thawed strawberries. I thought I was in for a wonderful treat and was so disappointed after my first bite. I couldn’t believe how something so amazing had transformed into something so gross. I don’t think it’s a taste I will ever learn to like. But that’s ok because there are ways around it. Like with this berry syrup recipe where you wait until the very end to add fresh strawberries. This way the strawberries hold their flavor and texture and don’t disappoint. We love this syrup over pancakes and french toast, but have also found some other fun ways to use it. Be sure to check back Wednesday for a fabulous quick and easy dessert that’s great anytime during the summer, but especially perfect for the 4th of July! In a 1/2-quart saucepan, stir together sugar and cornstarch. Stir in orange juice until blended smooth. Stir in frozen berries and bring to a boil over medium heat. Make sure to give it a stir occasionally. Once boiling, cook for 2-4 minutes, stirring constantly until slightly thickened. Remove from heat. Just before serving, stir in strawberries pieces. Serve over your favorite pancakes or french toast. Sometimes berries are sweeter than others depending on the crop which means that sometimes you need a little sugar, and sometimes maybe a little more or less. Start with 1/4 cup sugar and taste your syrup before it boils. If it needs more you can either add the entire extra 1/4 cup or you can add it by the Tablespoon depending on how sweet you want it. Now for a little giveaway!!! Are you ready to meet our newest sponsor? 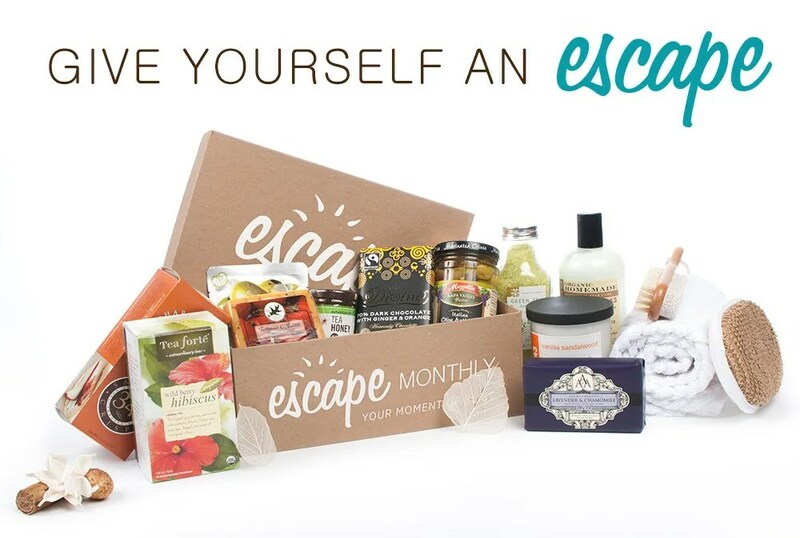 I’m excited to introduce you to Escape Monthly, a brand new company that creates destination inspired boxes full of luxury products to help you relax and renew. Every month, they curate high-quality products to help you slip into bliss—from spa & beauty products, to gourmet snacks & gift certificates. They also give a lucky member a vacation to their featured destination! Doesn’t that sound like fun? I know I could use a get away in a box every now and then. Escape Monthly is offering JCD fans a chance to win one of their amazing boxes (valued at $50)! Use the Rafflecopter form below to enter. a Rafflecopter giveaway Escape Monthly is offering JCD readers the exclusive coupon “YOURESCAPE”—worth 20% off for life! Click here to redeem yours! This giveaway opens immediately (open to US only) and closes at 12:00 AM MST on July 10, 2013. Winner will be announced here on the Rafflecopter form, contacted by email and has 48 hours to claim their prize by responding with their mailing information or another winner will be drawn. Good luck:)! *Disclaimer – I received no monetary compensation or products for this post. I just offered the giveaway because it looked like a fun product. As always, my opinions remain my own. Did you win the CSN Stores Giveaway? By getting a hot cup of coffee and a piece of chocolate and propping my feet up for 5 minutes. by finding anything that makes me laugh! They do say that medicine is the best laughter! I like a pretend beach! Spending some time in prayer, preferably outside in the nature, where nobody will bother me. It works every time! Sounds serene! I have a favorite place like this at hour summer lake house! I like to sit and watch a movie. What’s your fav? I love Overboard with Goldie Hawn! I’ve always wanted a porch with a swing! Browsing Pinterest or my favorite blogs! Reading a book while lounging at or in the pool with an ice cold iced tea! I got home from work yesterday aforonetn and mowed the lawn and blew leaves before the rain came today. After I mowed my lawn, I went next door to my neighbors house and mowed his lawn and blew the leaves off his property. I slipped a pay it forward card under his door mat when I was finished. He came over and thanked me for what I’d done, and also asked me about pay it forward. I often do things for other people, but yesterday it felt a little different because it gave me the opportunity to tell him about paying it forward; also in hopes that it would have a chain reaction and many lives would be effected by such a positive and simple notion of paying it forward .